A blog dedicated to the Silhouette Cutting Machines. You MUST use a Silhouette somehow in your project. Today I have created a field of flowers. I just love these Gear flowers. Hop on over and link up your project today. Beautiful wild flowers:) Gorgeous card my friend! Makes me want spring now...by the looks of it, it may be June before we lose all this snow, lol! So cute! I love the glossy accents on the flowers and clouds! Such a beautiful scene!!!! I love it!! Awesome job! love the patch of flowers, those gear flowers are amazing..... Pretty Nana! This is really cute, I love the glossy accents. Your card is just beautiful!! Love the flowers and the glossy accents you added. 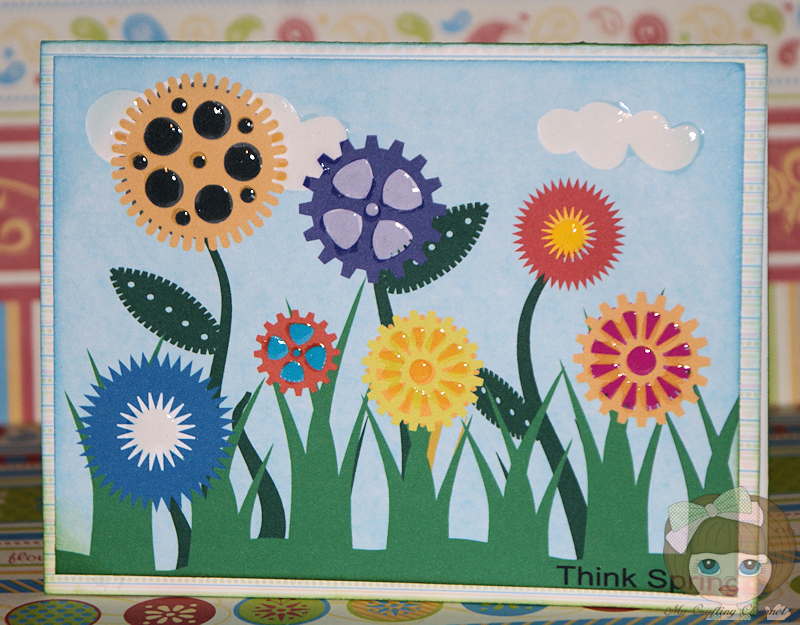 This card is gorgeous and I love this idea of the cogs. The glossy accents really does bring out the colours and depth.